Hysteresis Models: New and enhanced hysteresis models for nonlinear materials, hinges, and links have been added. Girder-Only Section Cuts: Girder-only section cuts implemented for steel I-girder bridge sections to capture changes in girder sections, staggered diaphragms, and splice locations in individual girders. This also improves the design and rating of steel I-girder sections by better accounting for the controlling section within each panel. Linked Model: A new action “Clear and Create Linked Model” added to the Action dropdown list in Update Bridge Structural Model form. Once selected, the previous program-generated linked model will be cleared (and cleaned) first and a new linked model created. Energy Plots: Step-by-step energy plots available for nonlinear direct-integration time-history load cases and for nonlinear static/staged-construction load cases. Nonlinear Hinges: Model frame nonlinear hinges as links, allowing for use of nonlinear modal time-history analysis (FNA) for faster analysis. 29 Comments for "CSiBridge 2017 v19.2.0 (x86/x64) Free Download"
stand alone license or not ? I installed in my E drive. But licence doesn't work. What can i do? Just wanted to drop a note and say thank you for the post. Appreciate it!!! You're the best! password for zip file, please? 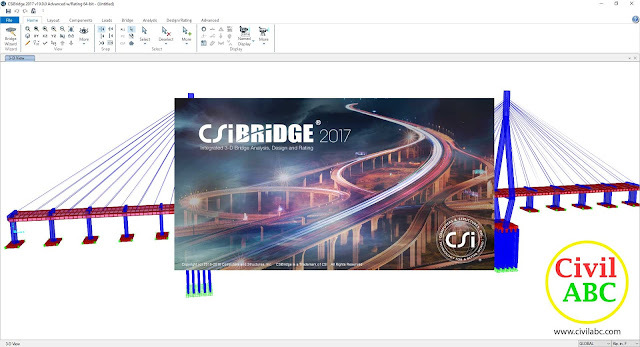 ZIP Password: www.civilabc.com, for CSI.Bridge.2017.v19.1.0_x64 file doesnt work anymore. the password of stand alone license? This license is going to be expire soon now. Please release a new license file. The link has already been updated. licence has expired. any other license until 2018?